There are about a million different umbrellas out there that claim to be “windproof” or even “indestructible,” but most of them will fall apart the first time you try to use them in a windy storm. The few umbrellas that actually do hold up to strong winds are typically pretty pricey, like our favorite mode, the Blunt Travel Umbrella. 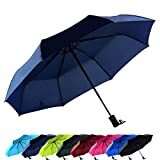 You don’t have to spend $60 to get a good umbrella that can withstand some serious wind, however, because Amazon has a very impressive model available for just $17. The Ecourban Automatic Compact Travel Umbrella will actually stand up to the fastest winds you’ll ever find yourself in. It also has a great design and an auto open and close feature, as well as a lifetime guarantee.